Migraph, Inc. has announced a new program for ST users looking for the ultimate image creator. Touch-Up, a complete image-design tool for producing high-resolution bit-mapped graphics, can be used to produce images for use in newsletters, presentations, brochures and more. 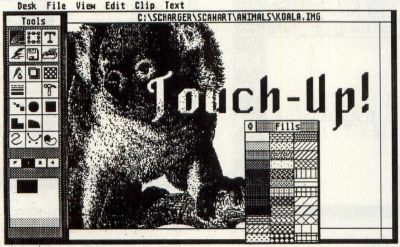 According to Migraph's president, Kevin Mitchell, "Touch-Up is the first full-featured graphics application for the Atari that produces bit images not limited by screen size. It combines a wide range of drawing tools with special effects, outline-font technology and screen-editing functions. Users will be amazed at the ease with which they can create high-quality images and headlines." Touch-Up's features include the abilities to create and edit images larger than the screen and to load and save pictures in a variety of formats, such as .IMG, Neochrome, DEGAS, Print-master, MacPaint and PCX. In addition, Touch-Up provides such drawing tools as Bezier curves and B-Splines and supports scalable outline fonts in many typefaces and styles. Images created with Touch-Up can used with desktop publishing systems such as Timeworks Publisher ST, PageStream and Migraph's own supercharged Easy-Draw. The program will run on color and monochrome ST systems with at least one megabyte of memory and is expected to retail for under $200.